We have known Hungarian PocketGuide, backed with $2M of VC money, since 2011 when the company came second at the Startup Week Vienna competition. Now we learn that its competitor from Russia TourPal has just raised $1 million from unidentified business angels to provide a similar service (source: Digit). 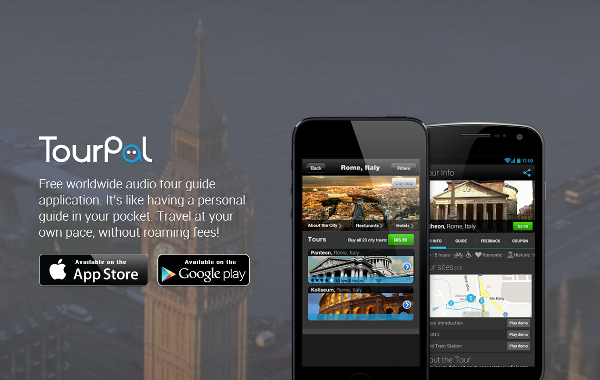 TourPal, just like PocketGuide, is a free app, but in-app purchases allow buying city guides. Both apps feature Berlin, London, Rome and Paris within its top 10 downloads, yet TourPal’s prices are 50 percent lower, and appear to cater to the German-speaking tourists since the German-language guides are the most popular in-app purchases. Since its launch a year ago TourPal claims that its app has been downloaded over 150,000 (according to Xyo.net PocketGuide has 100,000 downloads on iPhone and 250K on Android, and TourPal around 61K on iOS only). What is interesting though that despite the number of downloads at TourPal, the number of actual guide purchases is around 1000. It offers over 250 tours in 70 countries in 8 languages. Another interesting feature of the app is the online and offline maps (I paid for Belarusian AppsWithMe to have my maps offline). A free version offers the maps in online mode, showing the map of the tour, restaurants, the notable sights and a free 30-second intro to each of them. This might explain why so many users have downloaded the app in the first place, and perhaps this is what kills the need to make in-app purchases. The funding will be used to develop recommendations and an Android version of the app.